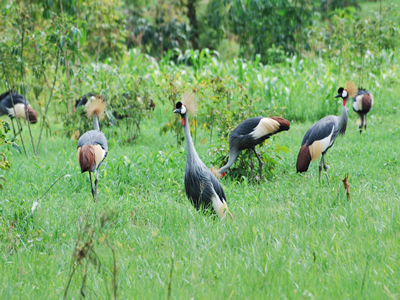 Lake Mburo national park - "Whispers of the wild"
• Wet lands habitats comprise 20% of the park's surface. and finally as a result of subsistence poaching. community projects such as building clinics and schools. permanent swamps and grassy valleys all support a wealth of	wildlife in a tropical setting. have also returned to the park after years of poaching and near extinction. woodland bird species are especially well represented. establishing the boundaries along with those of the original reserve. The park was finally opened to the public in 1984.
is the starting point for nature walks and game drives. from the campsite by arrangement. by a timber observation plat form. which passes rock kopjes, home to the elusive Klip Springer. seven more can also be seen from the Kazuma lookout, close to Kazuma track. groups, visitors, seminars and workshops. including nature walks, bird watching, boat cruises and game drives. Nature walks are conducted on foot with the help of an armed guide. cormorants can also be sighted along the shores. quad bike riding gives one a spectacular view of the park's terrain and wildlife. Email us on: info@ugandasafaribooking.com for free safari information at free of charge.